Happy (almost) New Year, my friends! 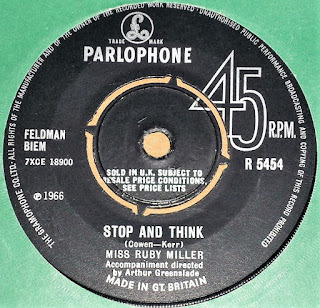 1966 was a good year for old ladies, and hot on the heels of their success with Capitol’s Mrs. Miller, EMI in Britain decided to invest in their own, home-grown singing septuagenarian, Miss Ruby Miller. Issued by Parlophone (now no longer helmed by George Martin, who left EMI the previous year to set up AIR) Miss Miller’s only 45, Stop and Think backed with Love Shades is a delight. Closer in style I think to Leona Anderson or Hermione Gingold that the wonderfully off-key warbling of our Elva. On promo copies of the single she appears as Ruby Miller, but on the released version, presumably to differentiate between the two women, ‘Miss’ was added to her name. 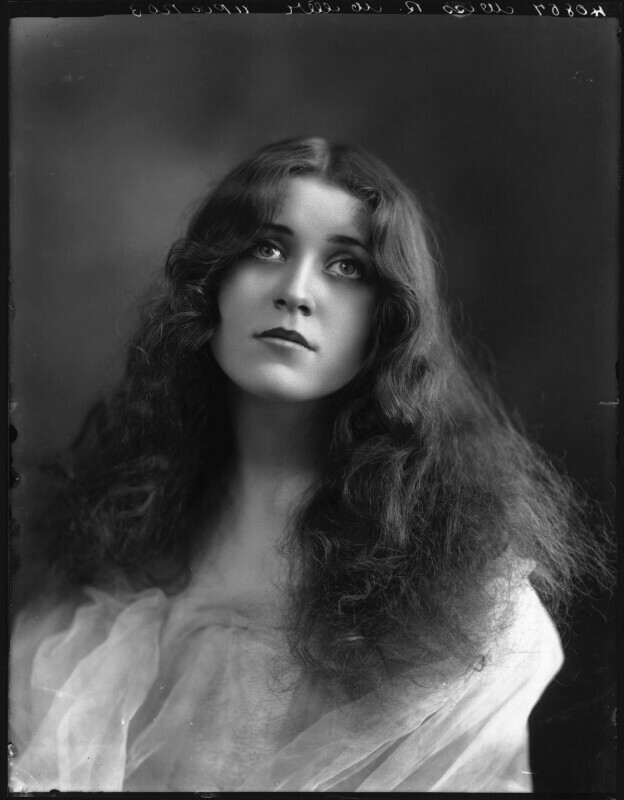 A former Gaiety Girl – one of the glamorous dancing troupe of fashionable young ladies who became the toast of Edwardian London – by the time Ruby recorded her sole outing she was 77, having been born in 1889. At 59, Mrs. Miller was a mere stripling. As an actress, Ruby appeared in many films, beginning with the rare British comedy short Frills (1916) and continuing through until the late 1940s. In 1923 she was spotted by an American talent scout and whisked off to Hollywood to appear in the F.B.O. production Alimony (just four years later F.B.O. would become the second Hollywood studio to release a feature-length “talkie”), and towards the end of her cinema career she appeared alongside Vivien Leigh and Ralph Richardson in Alexander Korda’s production of Anna Karenina. While appearing in films, she continued her career in theatre. In 1921 she starred in the Edge of Beyond, with a new young talent by the name of Basil Rathbone, and in1924-25 she appeared on tour in Arnold Ridley’s celebrated Ghost Train. In the early 1960s wrote her autobiography Champagne From My Slipper, and in 1962 she was awarded the ultimate showbiz accolade, starring as the “victim” in an episode of the long-running TV show This Is Your Life. Ruby died in 1976, just a few months shy of her 87th birthday. But what a life she had. Welcome, my friends, to the last look at terrible Christmas records for this year and, coincidentally, THE 500th WORLD'S WORST RECORD BLOG POST! First up is another reader recommendation. 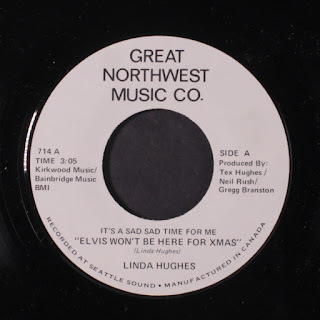 Regular WWR contributor Mikael Borg brought this particular horror, Elvis Won't Be Here For Xmas by Linda Hughes, to my attention recently and I had to share it with you… that is until I realised that I had posted it last year! Still, it bears repeating, especially as I am now able to fill in a few extra details on Ms. Hughes career. I’ve no idea of this Linda Hughes is the same young lady who was one of the early Micky Mouse Club Mousketeers, but I can tell you that she did record a bunch of songs, including What Am I Living For, Trash Can and others in the 60s for Seattle-based producer Tex Hughes (her husband, father or brother perhaps?). She also recorded a cover of the Elvis hit Return to Sender. At least two of Linda’s 45s were issued on Seattle’s Jerden label, the same company that originally put out Louie Louie by the Kingsmen. I’m struggling with the next choice, and realise that the reason for its inclusion here probably says more about my own liberal political views, but isn’t Jingle-O the Brownie (performed here by Tennessee Ernie Ford) just a little bit racist? With its roots in British folklore, a brownie is a spirit that is “usually described as ugly, brown-skinned, and covered in hair,” according to Wikipedia. The song was originally issued by Ford in 1960, on the flip of his Capitol single Little Klinker, a jolly little tune about Santa’s dog. Now, for a little extra, here's a truly great Christmas song that's bound to become a classic. Welcome, my friends, to our second look at terrible Christmas records this year. I’ve been overwhelmed by your suggestions, and the first brace of tracks today come courtesy of regular WWR contributor Michael Quinn: the peculiarly-titled Christmas America Is Proud of Nixon (at least that's how it appears on the disc's label) and the slightly less perverse (but possibly perverted) Santa Clause Kissed Me (sic) by Beulah. What a find! At just a few seconds over a minute, Christmas America Is Proud of Nixon is Beulah’s spoken-word Christmas card to her favourite president, old Tricky Dicky himself. 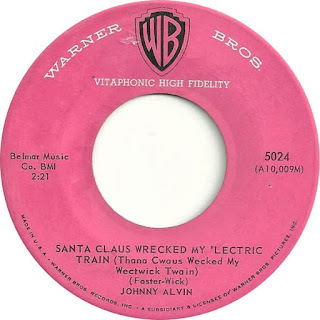 Tribute discs to Nixon were nothing new, but the flip is a pip: Santa Clause Kissed Me is an atonal delight, despite Beulah’s inability to spell Santa’s name correctly. I haven’t been able to unearth any info about Beulah (no relation to the TV character played by Hattie McDaniel, incidentally), apart from discovering that she issued her 45, on her own Beulah Records, in December 1974, taking out a small ad in Billboard to promote it. I'm assuming it was her first and only release. 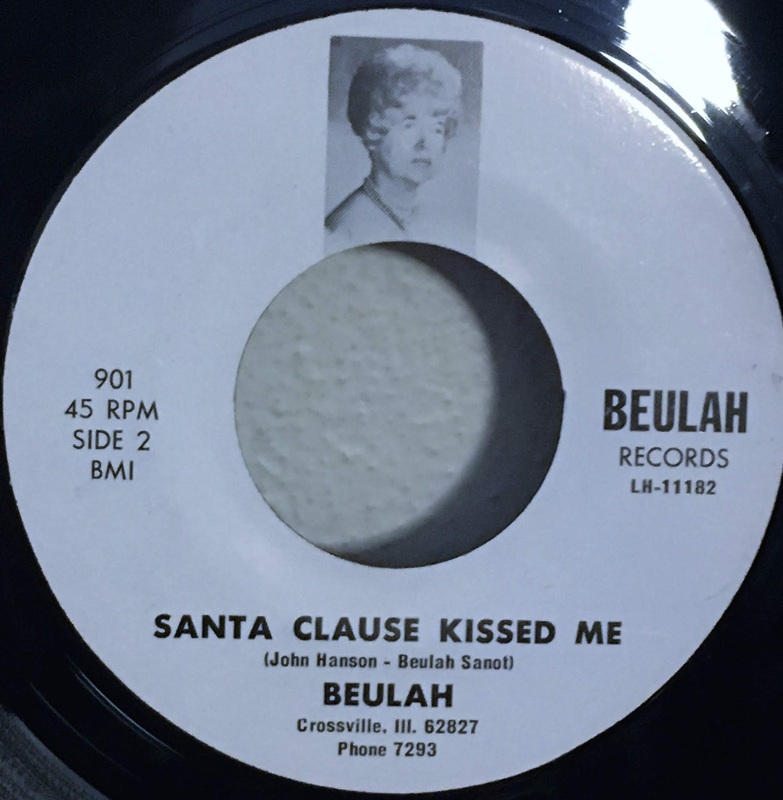 Credited as simply Beulah on the A-side but as Beulah Sanot on the flip, she appears to have come from Crossville, a small village of some 700 or so souls in White County, Illinois. I have not been able to find anybody of that name living in the area, but there was a Beulah De Santo in the region during the 60s and 70s: perhaps her surname was misspelled on the disc? Sadly that’s all I’ve got. Perhaps one of you can help fill in the gaps? UPDATE: Our good friend Bob from the ever-excellent Dead Wax has found a whole bunch of info on Beulah. Beulah Kershaw was born in 1914 in Florida, Missouri and, sadly, passed away in 2007 at the grand old age of 93. Much missed by family and friends, she recorded a further 45, A Woman In Love backed with Real People, that was issued in 1982 under the name Disco Beulah. The previous November she had appeared on the NBC TV show Real People: the experience clearly affecting her enough to write a song about it. It appears that Beulah also issued a four-track EP, featuring the song My Dear Green Mountain Home. Sadly her husband, Bryan, died the same year as A Woman In Love was released. There's a very sweet personal reminiscence HERE She must have been a very special lady. Today’s third track comes from little-known rap act Society Threat, who issued their one and only single, It’s Christmas, Yes It Is in 1988. The track was written by the whiter-than-white country-pop balladeer Peter McCann who also wrote Right Time Of The Night, later a U.S. hit for Jennifer Warnes, and Midnight Sun for our old friend Shaun Cassidy. In 1995 McCann issued his own festively-themed collection What Christmas Really Means. Welcome, my friends, to our annual look at the world of bad Christmas records. I’m kicking off this year’s Cavalcade of tinselly terror with a suggestion from an old friend. For many years, until its untimely demise a while back, Lord Of the Boot Sale was one of my ‘go to’ blogs for odd and obscure music, so I was incredibly happy to hear from its creator (and curator) recently. He kindly sent me a couple of tunes to share with you, and I’m honoured to do so. Released by Warner Bros. in November 1958, Johnny (on some copies he’s credited as Johnnie) was just nine years old when the single hit the shops, and he has the distinction of having issued Warner’s first ever Christmas-themed 45. 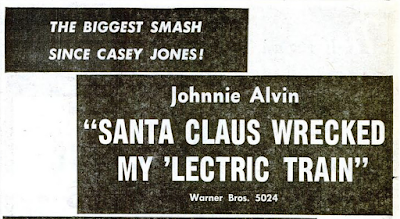 He is not, despite what Discogs may have you believe, the same Johnnie Alvin who was an American Doo Wop singer, active in the 1950s and 60s, who was a member of groups including the Fabulous Playboys and The Falcons. By some bizarre twist of fate, Johnny’s cover of Rudolph was the best-selling version of the song in the U.S. in 1960, despite competition from Paul Anka, Gene Autrey, Spike Jones, Guy Lombardo, David Seville and the Chipmunks and many others. As an extra, he’s another suggestion form The Lord, Little Susie and Who Put The Gum in Santa’s Whiskers… a little further down the ‘novelty’ route than we usually go here, but we’ll make an exception for this Dr. Demento favourite. Released in 1956 by MGM in the States (backed by Christmas Season) there was a second Little Susie single issued six years later, this time on Roulette, (Why Does Everybody Imitate) My Daddy on which Susie (I don’t know for sure if it’s the same Little Susie, sadly, but let’s assume that it is), playing the role of Caroline Kennedy, complains about people impersonating JFK. It’s silly, but nowhere near as brutally bad as her debut.